﻿ How to Create Share-Worthy Email Content this Holiday Season » Red Mango Marketing! Can you believe it’s time to start planning for the holiday shopping season already? You may think it’s too soon, but with big shopping days like Black Friday (Nov. 24), Small Business Saturday (Nov. 25), and Cyber Monday (Nov. 27) coming up in November, you’ll want to start planning your email marketing content now. In particular, you’ll want your email content to be share-worthy. This way your current audience will help you spread the word about your business to their friends, who make great prospects for shopping with you this holiday season. People like to support and spend money with businesses that share the same values and support the same causes. They also like to share information regarding those values and causes. If there’s a particular cause your business supports or values you stand behind, the holidays are a great time to remind your audience. You may be thinking about sending product ads to your email subscribers, but you also want to consider how you can add value for your audience as well. Content that people find valuable will get more use and more shares. As you might imagine, people still love to get a great deal. And they love to share those savings with their friends. Look for opportunities to reward your loyal subscribers with a special offer or promotion, and encourage them to pass along the deal to a friend. Join us for a free webinar, How to Have Your Best Holiday Season Ever. 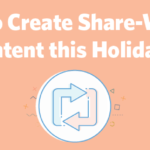 The post How to Create Share-Worthy Email Content this Holiday Season appeared first on Constant Contact Blogs. This entry was posted on Friday, October 13th, 2017 at 8:02 am	and is filed under Email Marketing, News & Updates, Online Marketing. You can follow any responses to this entry through the RSS 2.0 feed. Both comments and pings are currently closed.